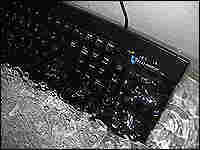 Are Computer Keyboards Dishwasher Safe? We put pots, dishes and silverware in the dishwasher. But a computer keyboard? Although manufacturers warn against it, NPR's Nell Boyce puts her keyboard in the dishwasher, and it lives to type the story. 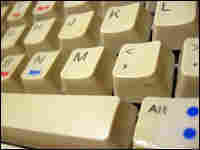 Studies show that computer keyboards have more bacteria than toilet seats. But it's hard to clean all those keys. So some people advocate an extreme solution: Throw your keyboard in your dishwasher. 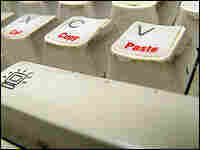 keyboard-in-the-dishwasher advice is all over the Internet. And don't we wish it were true? 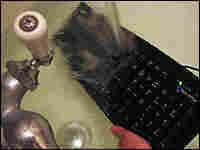 My keyboard is an old Hewlett Packard that's encrusted with a kind of mysterious black grime. I thought, "Well, why not try my KitchenAid?'" I was encouraged to do this by Scott Moschella, a computer guy who runs a blog called Plastic Bugs. "I think now when you type 'keyboard' and 'dishwasher' into Google, my site comes up as one of the first results," Moschella says. "Clearly, you know, all it takes is one geek to do something stupid, and you've got a whole bunch of lemmings who are willing to jump off a cliff with you." His keyboard came with his beloved first Mac computer. It was one of those stylish keyboards made of transparent plastic. You could see the grime inside, and it was getting unbearably gross and sticky. "I didn't want to throw away my keyboard," laments Moschella. "It was perfect — until the beer got spilled in it." That's when one of his friends said, "Hey, why don't you just use the dishwasher?" Moschella found the idea oddly compelling. "He said it as if I should have known, and it's something he had done before," Moschella said. "He had never, never done it. But he had that authoritative voice as some geeks get, where you want to believe." Moschella had nothing to lose. So, like me, he put his keyboard in and waited. He says it was an excruciating wait. I felt the same way as my dishwasher glugged and groaned. Finally, it quieted down and I heard a hiss as the drying cycle started. Moschella had suggested that the heat might not be a good thing, so I opened the door. Steam came out. My keyboard felt almost too hot to touch. It was dripping water. It was also absolutely spotless. But forget how it looks. According to Microsoft's Sean Butterworth, I had just made a big mistake. "We do not recommend putting our keyboards, or any keyboards for that matter, in the dishwasher," he says. "What will cause the problems first, is the short-circuiting in the wiring." Butterworth should know. At Microsoft's hardware division, people check out every possible thing that might harm a keyboard. "We test with everything from cracker crumbs, salt and pepper, hair," he explains. "We even create a special solution we call artificial sweat." They have also submerged keyboards in plain water. "And that gets you relatively close to what it would be like if you put it through the dishwasher," Butterworth says. "And typically that makes most keyboards lose functionality." Other major manufacturers have the same party line. Robert Gulino, with Logitech, told me I could wipe the surface gently with a damp cloth. Or, blow out dust with a little can of compressed air. "But, you know, in terms of washing it, we certainly don't recommend that," Gulino says. "If you did want to be able to do that, it would have to be a very different keyboard. The electrical components inside would have to be encased in membranes. But we just don't do that." A few companies do. In fact, a Florida company called Seal Shield makes keyboards that are "dishwasher safe." It says so right on the box. Brad Whitchurch says water is no problem. "We have about a nine-foot cord, and I've taken it down to the bottom of a swimming pool, and it worked fine," Whitchurch says, explaining that he left the monitor and the actual computer on the side of the pool, of course. He typed in "The Seal Shield keyboard works when wet." It really does — I tried it in my bathtub! The company mainly sells these keyboards to hospitals, where cleanliness is a life or death matter — even though studies have shown that just wiping down a keyboard with disinfectant can do the trick. You too can buy this waterproof keyboard — if you're willing to pay about $50. I was just hoping my keyboard wouldn't have to be replaced. After its ordeal in the dishwasher, I let it air dry for a week. Then I plugged it in and started to type. I tested the space bar, the return key, all the numbers and letters. It seemed perfect. Still, my fellow washers, like Scott Moschella, point out that we may never really know. His Mac keyboard also seems fine, he says, but "honestly, there are some keys that I haven't ever hit, like the F6 key. I don't really know if that key works." For him, it's good enough. But he says if you've got a fancy keyboard, with all kinds of bells and whistles you can't live without, you may not want to try this one at home.